I get a lot of emails from people asking questions about sharpening, I love emails by the way, and over the years, a familiar pattern has developed with respect to the context of the emails, the questions asked. Much of it has to do with burr formation which in the process can lead to a common problem which is pressure, using too much pressure in an attempt to form a burr and then using too much pressure after a burr has formed, during the refinement stage. So I will attempt to lay down some simple steps to follow for those who are having some issues. Also keep in mind that there are a lot of things going on when you are learning, you need to manage your expectations and remember that everything gets easier and I mean much easier after muscle memory for sharpening, holding an angle is achieved. You can only build muscle memory by repeating a motion over and over and for knife sharpening by freehand, you need to do it about 30 times to get those stabilizing muscles built up. Establish a sharpening location in your house where you can start to form a sharpening pattern, once set up, you can grab everything you need in right there, stones, stone holder, water, cloth, it's all there. If you find yourself having to hunt things down then chance are you won't, you won't bother so get yourself setup. Don't forget a tray of some type to catch the water and mess. You can keep it simple as well, you don't need fancy, expensive things but you need a SHARPENING STATION. It took me a long time to get mine set up perfectly for me. Oh, and don't forget to get a good light, it's very important. 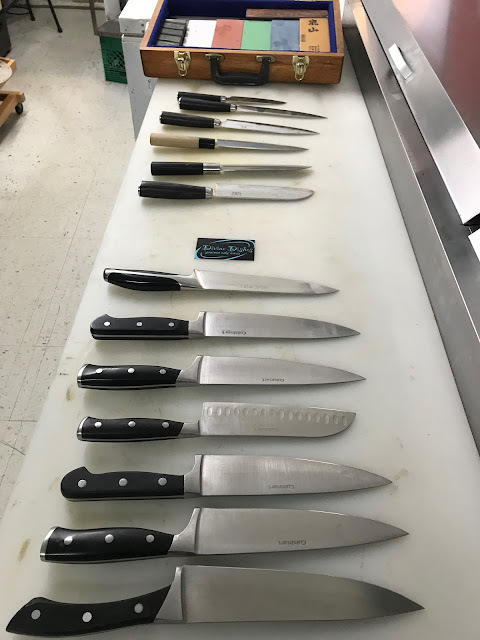 If you have decided to get yourself into freehand sharpening you need to have a sharpening budget from about $100.00 to $400.00 but know that for that initial 100 bucks you can get all you need to make your knives sharper than new, in terms of materials that is. A good water stone, don't set yourself up for failure by going to the hardware store and buying a $10.00 no name oil stone. Spend at least $30.00 on a King 1,000 grit stone. Be careful on Amazon as well, there are an overwhelming number of stone brands, so if you are not sure, fire me an email. There are many many good brands available in Canada and the USA that can be shipped anywhere. 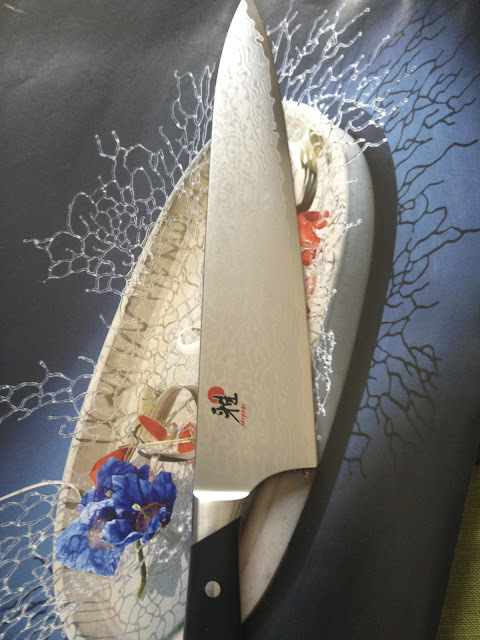 Chef Knives to Go, Knifewear, Pauls Finest to name a few and of course Fendrihans if you like Shapton Glass. YOU NEED a whetstone, if you buy one get a 1,000 grit stone if you buy two get 320-600 grit stone as well and if you go for three, the best setup bet a Coarse, Medium and Fine, (5,000 to 6,000) grit stone set. A very common setup I use is 400, 1,000 and 5,000. I've sharpened thousands of knives using these three stones. So go with what your budget allows and realize that successful sharpening is all about developing, strengthening your technique, not about the stones. Having said that, get a good set, or at least one. You need some cloths to dry off the knives and to wipe off the stones after use. Now this is important, don't neglect this. You need to have a way to flatten the stones and the most simple is a piece of rough sandpaper, 100-300 grit taped to piece of glass or something very flat. There are tons of videos on this subject, SIC powder, Diamond plates, Lapping Plates, whatever it is, you need something. Stones do not have to be perfectly, geometrically flat but they should not be dished at all. Also, flatting cleans them and refreshes the surface. Get yourself a quiet, comfortable spot where the things you need just seem to fall into your hands. Get a grasp of the fundamentals. You have to understand of course what it is you are trying to achieve and you can keep this simple. There are too many videos out there so narrow that video library down to one or two that you enjoy. I like the videos by Jon Broida at Japanese Knife Imports and they are easy to find. All the videos you need are linked on my Website. As you may know I did a series called Sharpening School at Knifeplanet.net with videos and accompanying articles which cover the basics and beyond and Jon participated in those as well. Do not be intimidated by video clips of people slicing tomatoes and grapes, that is important right now, or ever and remember to manage your expectations. Nowhere in the Fundamentals Instruction will it describe how to slice a tomato. It will come down to BURR FORMATION AND BURR REMOVAL. Your ability to form a burr will depend on your level of skill, your patience, the knife, the stone and again, your patience. Many novices find it difficult to detect a burr, so practice often as you work a feeling for a burr by holding the knife in your hand at the right angle to feel it. If you just run your fingers down the side of knife, or your thumb on a knife that is held straight up and down at 90 deg you may not feel anything so angle blade a little, at 70 deg so that as you run your thumb down from the spine over the edge the burr, that may be there, is more detectable. This is a common problem for burr hunting, holding the knife at an angle that makes it difficult to find. NOTE that the burr can be sharp, be careful. Once you have successfully formed a Burr on both sides of the knife, consistent in size and running from heel to tip you must reduce your pressure to commence the removal of the burr. Burr formation is a one time thing with one knife, now you may form additional burrs, I mean it may just happen but your goal is to form the burr (both sides) once. So the burr forms first on the opposite side of the side you are sharpening on and then it forms on the other side as you flip the knife. So the first burr forms then when you flip the knife you are forming a new burr which is composed of metal material from the both sides of the knife, you shifted metal from one side to the other, now by your sharpening motions you are removing some of that metal but it may it may be mixed in with the new burr. If that seems confusing, don't worry about it. BASICALLY, you form one burr on one side, flip the knife and repeat your actions to form a burr on the other side. The burr when formed is an indication that you have removed fatigued metal from the edge, you've reached the edge of the edge. 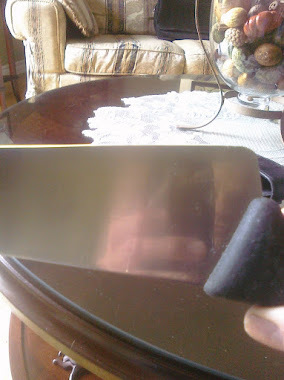 This action exposes fresh new steel, this the steel that you will be working on, you are getting rid of the fatigued metal that has folded over at the Apex of the knife on both sides and finding the metal that has yet to be touched underneath that layer of tired out, used metal. 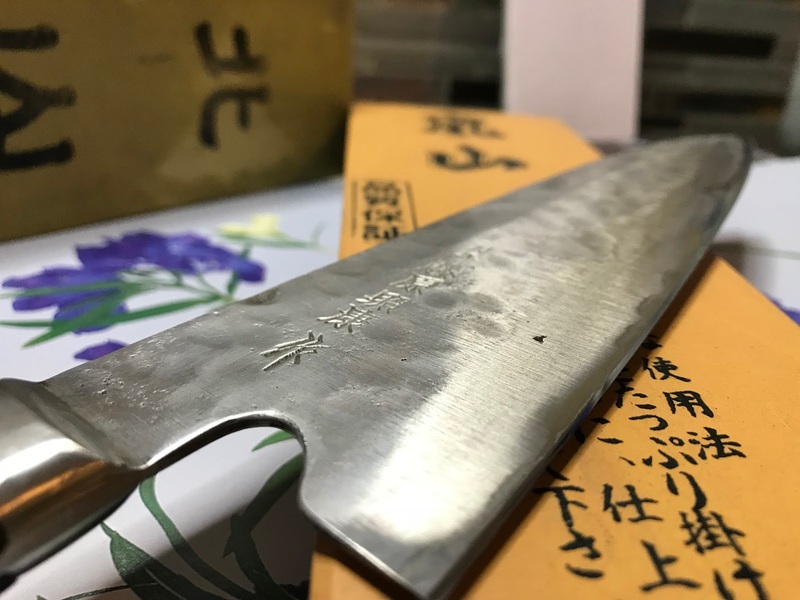 Over time, as your skill develops you will understand that the smaller the burr the better, this is because you don't want to remove steel needlessly, only the stuff that is making the knife dull. 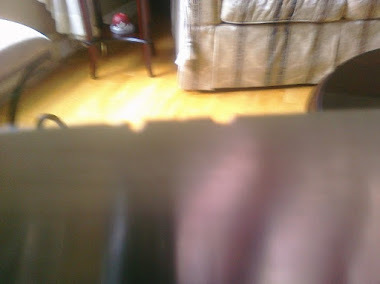 This fatigued metal is metal that has moved from it's position at the primary edge over to one side or both of the edge because it can no longer withstand the pressure of everyday use in a kitchen. It just got worn out that's all. So you are going to send it away by sharpening the knife. It is a basic concept really but pressure plays an important role. 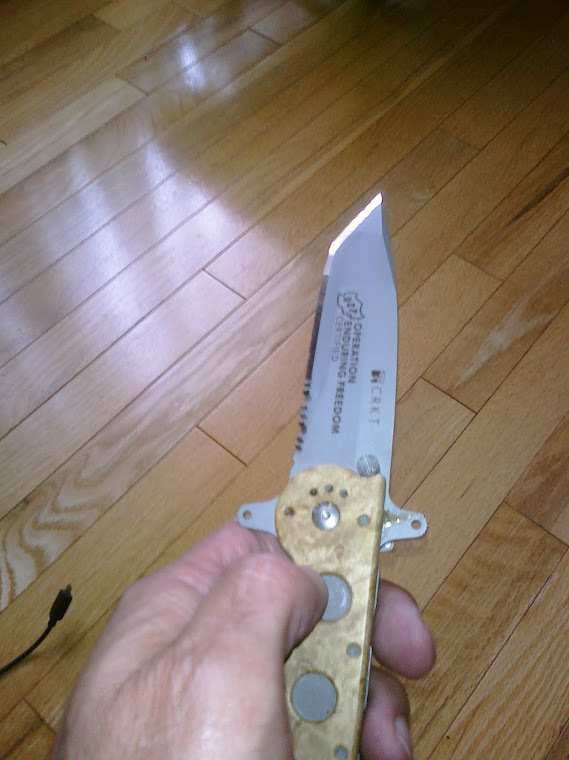 When I pick up a knife I use a level of pressure that is appropriate for that particular knife edge. If it is very dull, which is normally is I use what I call Heavy Pressure, (P4) pressure which is the amount of pressure required to form a burr. Your "Heavy" pressure and mine may be different but put simply, it is the amount of pressure I need for a given knife to raise a burr using a coarse stone. If I didn't use the degree of pressure that I do, then burr formation will be very long or not occur at all. Once I have formed the burr on both sides of the knife I decrease the pressure by 50% and I am now at the Burr Removal stage. I will never use that level of pressure (P4) again that I started off with on the same knife. I use four levels of pressure, P4-P1 in an effort to form the burr and then remove it and I use these 4 different levels on the first stone only. When I go from a 400 grit for example to a 1,000 grit stone, I go from four to three levels of pressure and so on until the knife is done. The first stone, coarse stone is P4-P1 and every stone I use after is P3-P1. If you are using one stone only you can still do this, you'll just use four levels, that is if you follow what I do. If not, as long as you start with a burr forming pressure and then switch to burr removal pressure, it's going to work. You will often hear the term deburring. I have found that these diminishing levels of pressure remove all traces of the burr but it is essential that the final result is a clean edge and free from any residual burr. So if you want to run the edge over a cork to ensure that the burr is gone you can and there are other methods of deburring. My method is the four levels of pressure. This is all explained in my video. The problem I see, the issue that repeats itself in videos is when folks are using too much pressure on a finishing stone, so just ease up folks. LESS IS MORE, seriously. If you find that the knife is getting duller the more you sharpen, you are using too much pressure. 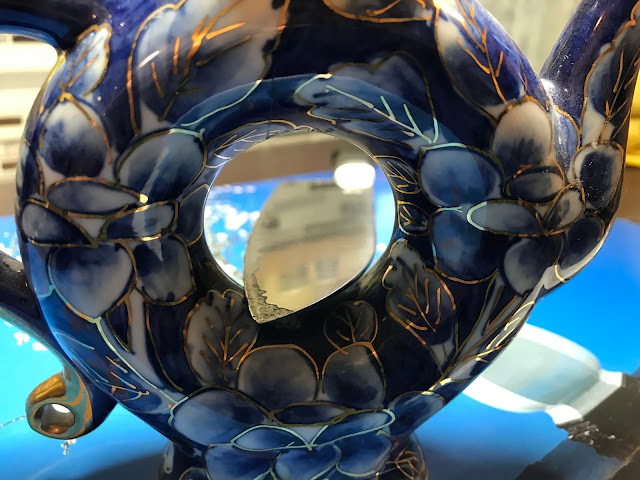 The other culprit is that you may not be hitting the edge, and this is where a Loupe can help you, you need to be reaching the edge of the edge to be effective. A Sharpie can also help you get you on target by painting the edge of the knife and then looking to see if you are removing the sharpie. Try using the sharpie to not just paint the edge itself but go up further behind the edge, to the area that you should NOT be sharpening. If you are removing metal from this part of the blade as revealed by sharpie being removed, you can adjust accordingly. You can remove the sharpie with Acetone. Sharpie is good tool to see where you are grinding metal, it will guide you. To help build sharpening muscles, you can paint the edge of the knife with a sharpie and then with light pressure, remove it. Now, repeat this on the other side of the knife and remember to use light pressure and at least a 1,000 grit stone. This is just an exercise to build up those confidence building sharpening muscles. You can repeat this process over and over and try different levels of pressure. 2. Find you Pinky Angle as described above, it will be about 16-19 deg. 3. Sharpen the knife using light pressure, just a stroke or two to see if the sharpie is removed. 4. Repeat this over and over, repainting the edge and bevels and relocating the pinky angle. Make sure you do this on both sides. If you are sharpening knives made in Japan or just very hard, carbon steel knives that will accept a more acute angle such as 11 or 12 deg per side, build up memory for that as well. So at the end you will have an Average Knife Angle (15-20 deg per side) and, or, a Dream Knife angle (10-15 deg per side). These are very simple things that you can try once you have got yourself setup..